The elephant in the room points to an issue that is not being addressed. The elephant in the room is a hard subject that is easier to avoid. Aging parents, relatives and friends who are unable to recognize their own situation. Loved ones, otherwise responsible people, who are unable or unwilling to take personal responsibility for their aging. Pro-active aging or pro-aging is to anticipate and plan for the “next step” of life. It is a measure of personal maturity and, in pro-aging families, there is little or no Annie in the room. However, we are living in a time when people are living longer than in previous generations and the responsible thing to do is often met with resistance…even though the answer is obvious to most everyone: the elephant in the room. We must respect the resistance of our loved ones, even as we must do what needs to be done. We must seek understanding, and where that is not possible, seek counsel regarding best care guidelines. The decision is not easy and often not black or white…it’s gray, just like an elephant. St. Anne’s Retirement Community understands the elephant in the room. 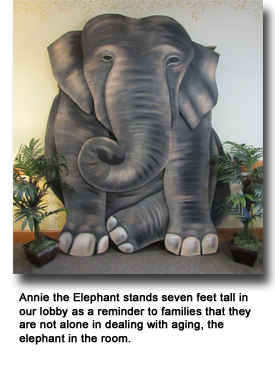 Every day, families seeking a safe home environment for relatives come to our door and see Annie, our elephant who stands seven feet tall. Her friendly expression brings smiles to faces and serves as a reminder that we are not alone in dealing with Annie, the elephant in the room. Do not avoid Annie, as it only makes the outcome more averse to all. Gather all parties and make a plan of care for your loved ones. Include your loved ones in every step of the process. Meet with an expert to help facilitate a difficult conversation and make sure you are clearly seeing the options. St. Anne’s Retirement Community promotes proactive aging by encouraging and facilitating conversations about Annie, the elephant in the room. To meet with our Admissions team and discuss plans for you or a loved one’s future, please call 717-285-5443.